A “monstrosity” and an early jazz smash hit share the shellac on this entry of Zayde’s Turntable! 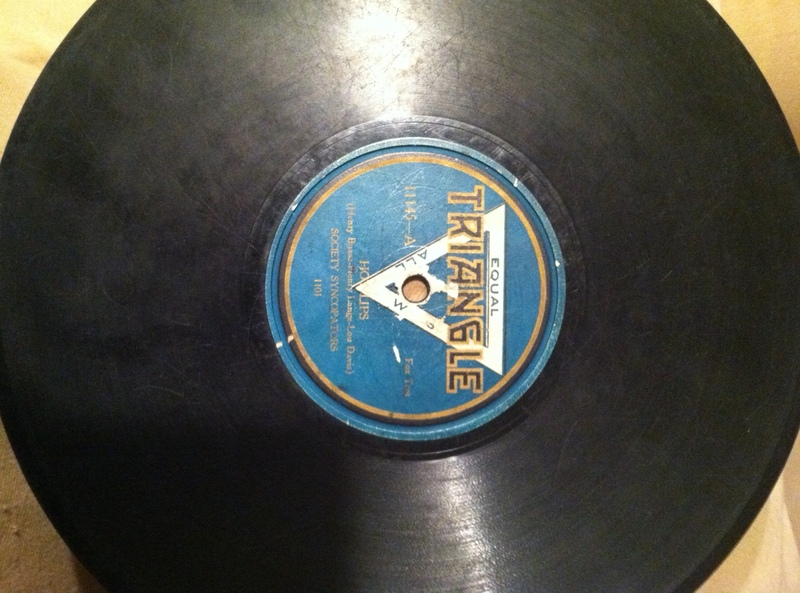 Triangle was a short-lived label affiliated with the New York Recording Laboratories (Paramount) and manufactured from September 15, 1922 to 1925 at the Bridgeport Die and Machine Company on Elm Street in Bridgeport, CT. The label touts the innocuous slogan “Equal All Ways.” Triangle, like most of Bridgeport’s labels at the time (Puritan being perhaps the most voluminous) drew on Paramount masters for their tracks until 1924, when Paramount collapsed in bankruptcy and the manufacturer turned to Emerson for masters. Their contract with Paramount restricted Bridgeport’s sales primarily to the east coast and mid-Atlantic, much of which was done through department store retailers and mail order firms. With the move to Emerson in 1924, the company was able to branch out and took on the Hudson and Mitchell labels out of Detroit in 1924. 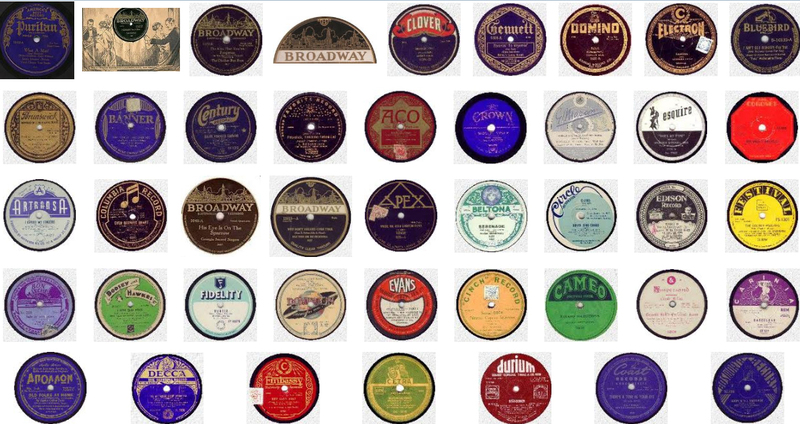 Bridgeport was an incredibly prolific manufacturer of early 78s, as a sampling of just some of their associated labels makes clear – Baldwin, Belvedere, Broadway, Carnival, Chautauqua, Everybody’s, Hudson, Lyraphone, Mitchell, Music Box, National, Pennington, Puretone, Puritan, Resona, Supertone, Triangle, and Up-To-date, just to list a few. Just a sample of some Bridgeport labels. In addition to Paramount and its myriad affiliate labels (Broadway, Puritan, etc. 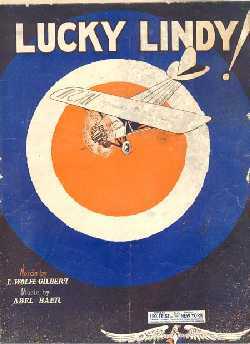 ), in their contract with Emerson the company pressed discs from Dandy, Grey Gull, Blu-Disc, Pathe, and Banner material. They even, briefly, issued their own master series (which can be identified by the master prefix “BDM”), which appeared on later Triangle labels from 1924 to 1925. Triangle classical records were also released (with catalog numbers in the 15000s), as were standards (9000s). Triangle met its demise with the July 1925 bankruptcy of the Bridgeport Die and Machine Company. Unlike other Bridgeport brands, which made their way into other company’s portfolios, Triangle did not live on, leaving just a four year window for their manufacture. To that effect, Triangle label records meet the general requirement for valuable records to be scarce. Of course, the quality, importance, and scarcity of the music still play a role. This album, Triangle 11145, is in fair condition. It has wear to both sides, with the expected impact on the quality of the audio. The paper label shows considerable wear, rendering some of the text unreadable. 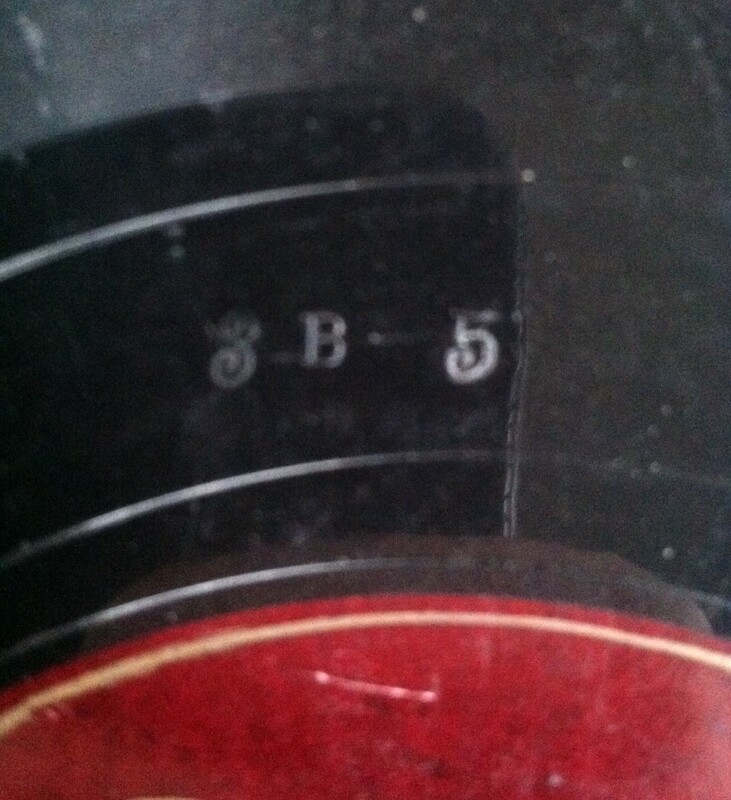 It is an acoustically recorded 10-inch diameter 78-RPM black shellac disc with lateral grooves and a ¼” spindle hole. 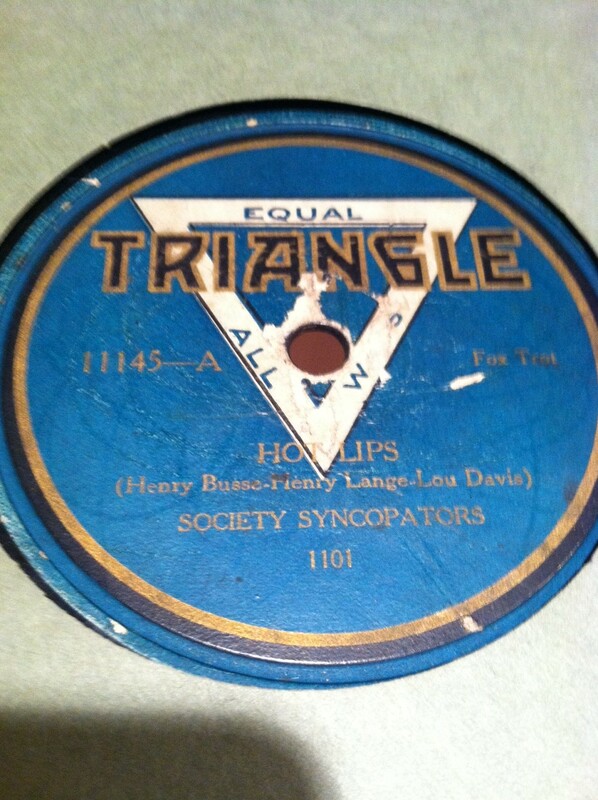 The A-side recording features the Society Syncopators performing “Hot Lips,” by Henry Busse, Henry Lange, and Lou Davis. 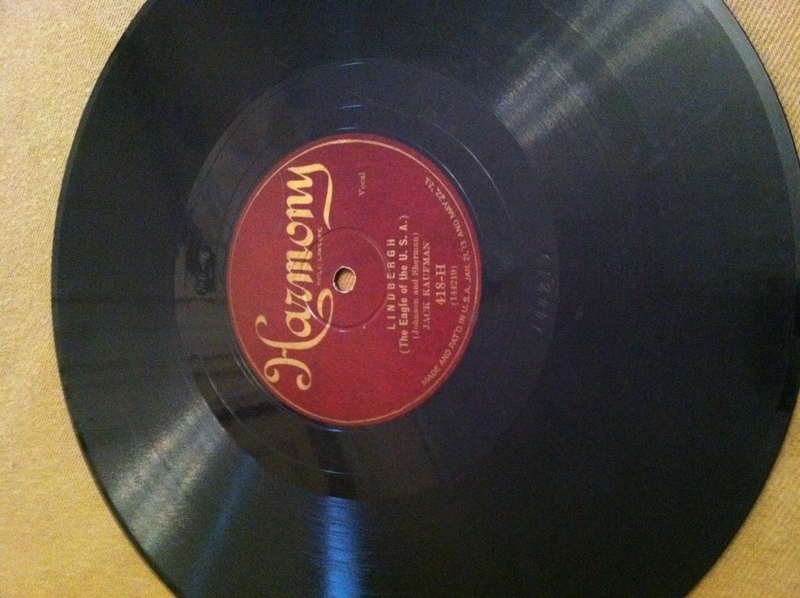 The master number is 1101 and it was recorded June 29, 1922. 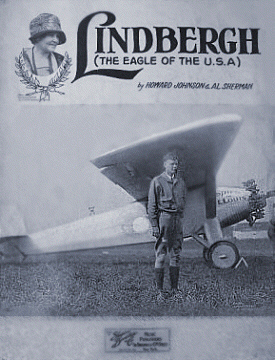 It runs 3 minutes and 22 seconds and was published by Leo Feist Inc. of New York. 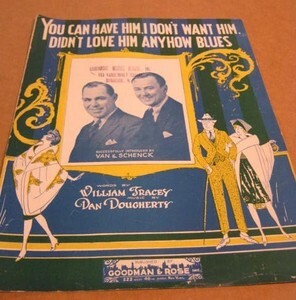 The B-side recording is the same group performing “You Can Have Him, I Don’t Want Him,” by Dan Dougherty, with lyrics by William Tracey (though Tracey’s name does not appear on the label here, since this version is an instrumental only – no vocalist). 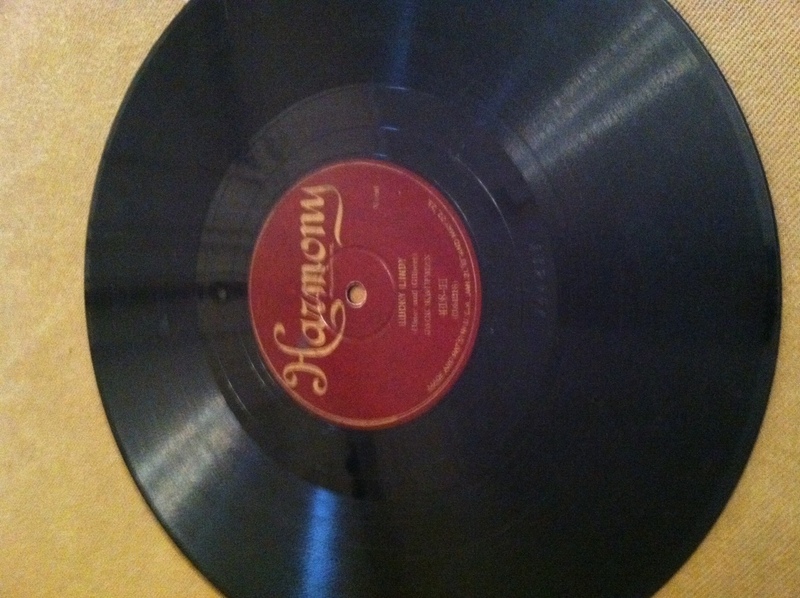 The master number is 1100 and it was recorded the same day, June 29, 1922. It runs 3 minutes and 12 seconds. It’s interesting to note that the recording date actually precedes the establishment of the Triangle label by three months; this suggests that the recordings were likely made as a Paramount master and intended to be distributed on other labels, which, indeed, they were. The record does not appear in Les Docks’ value guide for 78 r.p.m. records, though there is one dealer selling the same recordings on Regal 9341 for $14.95 on Ebay. 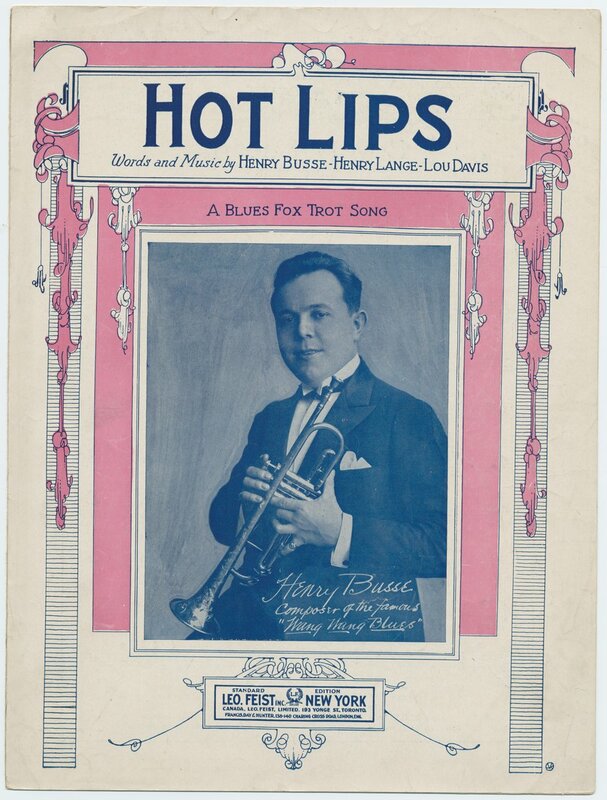 “Hot Lips” (not a reference to the M*A*S*H character; the lyric is “He’s got hot lips when he plays jazz” and refers to the instrumentalist) was written by Busse, Lange, and Davis as a “blues fox trot” for male trio and solo trumpet, for George White’s Scandals of 1922. The Scandals were a string of revue style Broadway shows, produced by George White, that ran from 1919 until 1939. The 1922 cast included Lester Allen, Dolores Costello, Peggy Dolan, W.C. Fields, Winnie Lightner, Sally Long, Paul Whiteman and his orchestra, and the George White Girls. Busse was a founding member of the Whiteman orchestra and the song (released on Victor as 18920-A) went on to become a #1 hit for the group in 1922, holding the spot on the charts for six weeks. Legendary saxophonist Clyde Doerr played sax. Whiteman’s band recorded the song on June 23, 1922 – just six days before the Syncopators’ recording was made. The Whiteman recording was featured on the soundtrack to the Oprah Winfrey film The Color Purple in 1985. Busse himself led his own orchestra in the popular song 12 years later on a Decca, #25015-A, recording. Busse’s track was also used across the pond on Brunswick 03791-B, an English record, released the same year. The Decca track was also later re-released as a 45 r.p.m. Eventually it was the title track on a 33-1/3 r.p.m. LP. 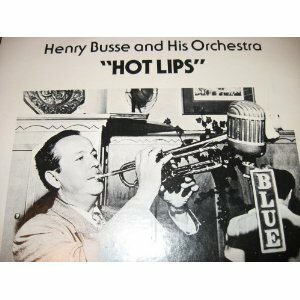 Henry Busse on the record cover for the vinyl LP “Hot Lips,” featuring his signature tune as the title track. Boy, how he goes, when he plays Blues. With two hot lips, he’s got hot lips. 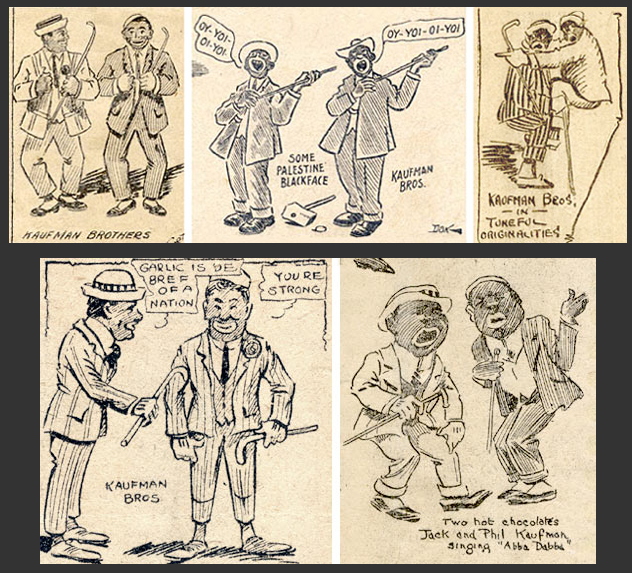 After the Whiteman recording a plethora of other groups took on the hit song – including the Society Syncopators. Also in June 1922, the California Ramblers made a recording of the tune on Vocalion 14384-A. 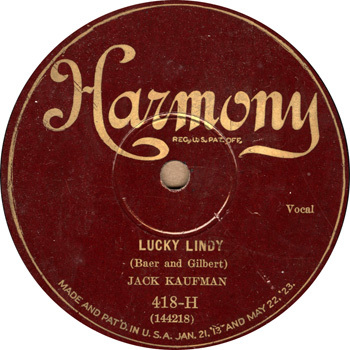 In August 1922 Bailey’s Lucky Seven pressed it for Gennett 4935-A. The Cotton Pickers made a recording of the song in July 1922 for Brunswick 2292-B. 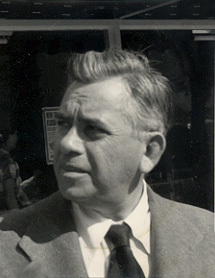 Henry Lange, one of the song’s composers, and his orchestra pressed it for Gennett 6263, Superior 306, and Genett Special 40102 concurrently in 1927. Even into the next decade, the song remained popular, with the Hoosier Hotshots releasing a recording of the “Novelty…Hot Dance with Singing” on Melotone 7-06-60 after recording it on October 5, 1936. Henry Busse (1894-1955) was born into a musical family in Germany. Originally raised as a violinist, he had to abandon the instrument after a broken finger was set improperly and did not heal correctly; the boy picked up a trumpet in its place. Busse was made by his family to play in an “Oompah” band led by his uncle and he despised it; he made numerous attempts to escape, finally succeeding in 1912. Crossing the Atlantic, Busse found himself in the German neighborhoods of New York. Homeless and unable to speak English, Busse was picked up by the police while sleeping in Grand Central Station. After his release he found menial work on a ship heading to California; while at sea his English improved and by the time he landed in Hollywood the adventurous 20-year old was landing extra roles in Keystone Cop films (one can imagine his performances being inspired by his own run-ins with the police in the Big Apple a couple of years prior) and, fortuitously, playing his trumpet in movie theater pit bands. 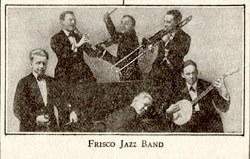 Busse initially played with the “Frisco Jass Band,” also called the Frisco Jazz Band (not to be confused with the Frisco Syncopators – see below) before forming his own “Busse’s Buzzards,” which went on to develop into the Paul Whiteman orchestra. Despite being subject to discrimination due to his German accent, Busse found success in the California music scene. 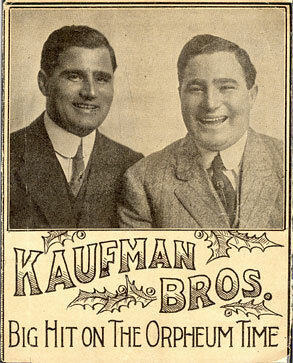 At one point in the 1920s eight of the top ten sheet music sales spots belonged to his band and Busse himself brought in more than twice the earnings of fellow band member Bing Crosby. Other members of the band included Tommy and Jimmie Dorsey. Busse began to tour and take his talents overseas and across the states. For a while in the 1930s he ran the house band at the Chez Paree in Chicago, where he worked directly for the club’s owner – Al Capone. Back in California Busse’s career found him leading bands appearing in feature films, including one with a speaking part for Busse – “Lady Let’s Dance”. Busse in a promotional photo taken by the William Morris Agency when he was near the height of his celebrity. Busse became a celebrity, with all the attendant scandal: after he partied hard at the Hotsy Totsy Club one night, he awoke the next morning married to a woman he had met the night prior. The legal wrangling for the annulment lasted 18 months, during which Busse toured Europe. Busse married twice more and professionally continued to lead his own dance orchestra, the Henry Busse Orchestra, until his death in 1955. Henry Busse’s fascinating life ends with not a little irony: the trumpeter was playing with the Shuffle Rhythm Band at a professional convention in Memphis when he suffered a heart attack. The meeting was the National Undertakers Convention. Henry W. Lange (1896-1985), the “monarch of the ivories,” was introduced to music through a friend of his father: Arthur Kortheur, the conductor of the Toledo Orchestra in the early 1900s. After Kortheur’s death Lange’s musical education continued with the accomplished pianist Max Ecker. Lange graduated from the Illinois College of Music and went on to serve as music director for a handful of radio stations (WOAI San Antonio, WFAA Dallas, and WHIC Dayton) and pianist for a number of hotels across the southwest. From 1920 to 1924 he played with the Paul Whiteman orchestra in New York at the Palais Royale, where he crossed paths with Henry Busse. With the Whiteman band Lange served as one of the trio of pianists in the 1924 premiere performance of George Gershwin’s “Rhapsody in Blue” – the other two being Gershwin himself and Ferdie Grofe, who shared a regular stint with the Whiteman band with Lange. Lange was apparently quite versatile, appearing both in dance bands and with the Ziegfield Follies, and in European tours performing classical concerts for members of the aristocracy and even royalty. His original piano compositions and performances were released on Ampico, Duo-Art, Melodee, Brunswick, Gennett, and Pathe, among others, and he spent some time as composer to the filmmaker Rudolph Valentino. 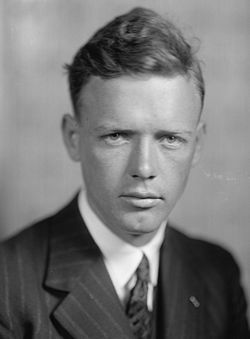 Lange struggled with health problems for much of his life, and was forced to put his music career on hiatus for a period in the late 1920s. Unfortunately, when he was finally able to return to the circuit, the Great Depression struck and most of the bands dissolved. He performed solo under the moniker “Monarch of the Ivories” for a while, resumed his radio work, and eventually retired. The final credited name for “Hot Lips” is Lou Davis, about whom I could find almost nothing. The always-helpful World Catalog does reveal an extensive collection of original songs from the period with him named as a composer, lyricist, or arranger (I couldn’t determine which), but there is no biographical information about him that I could identify. If you know anything about Lou Davis, please share it in the comments! 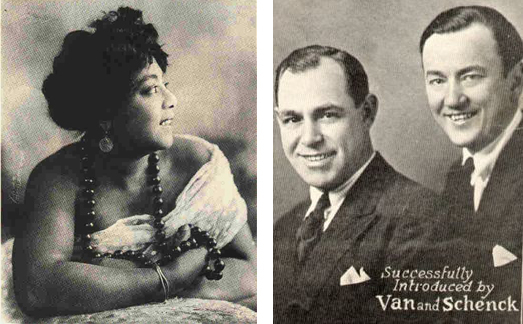 Mamie Smith (left) and Van & Schenck (right). It is fascinating that two entirely different types of musicians/performers could record this song. 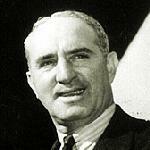 Dan Dougherty (1897-1955) of Philadelphia joined ASCAP in 1927 and saw many of his popular songs end up in early films. He composed for Sophie Tucker and collaborated with Nick Kenny and Jack Yellen. His most well-known popular works include “It Certainly Must Be Love,” “It’s All In Fun,” “Glad Rag Doll,” “Mollie,” “Alone in the Rain,” “Moaning for You,” “I’m Dreaming,” “Sittin’ on a Rainbow,” “You’re Still in My Heart,” Mr. Segal, Make It Legal” (“the story of a girl who sleeps with her boss and gets pregnant. Naturally, the boss won’t answer her phone calls, hence the lyric, ‘Mr. Siegel, please make it legal.’”), and the political ditty “Let’s Get Behind the President” written with George Jessel for Harry Truman in 1949. 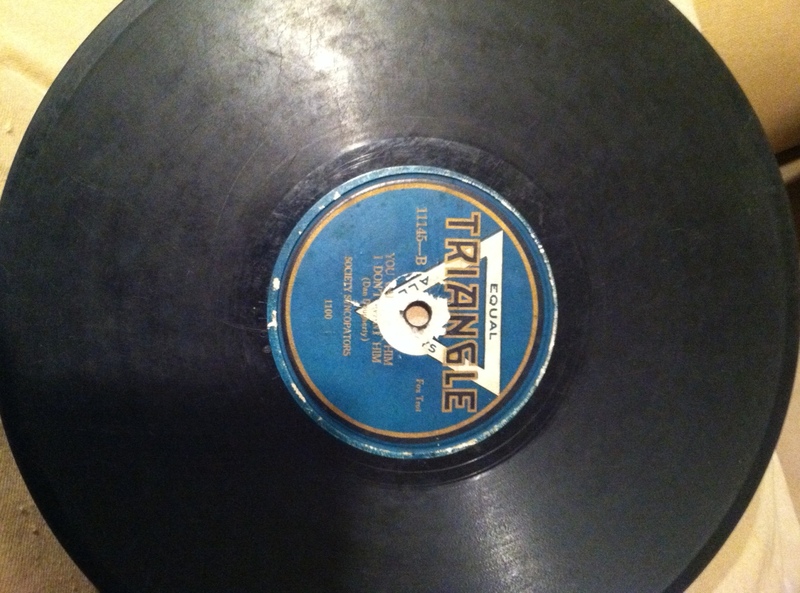 “Glad Rag Doll” is perhaps his most recorded and longest-lived song, with versions being pressed by Dolores Costello for the 1928 film of the same name, again in 1928 by Ted Lewis and his band, Arthur Briggs and His Boys and Earl Fatha Hines in 1929, Tommy Dorsey, Ruth Etting, Johnnie Ray in 1954, Kay Starr in 1955, Barbara Cook in 1975, Joyce Moody and Earl Wentz in 2007, and Diana Krall in 2012. Other films with music by Dougherty include shorts Aunt Jemima: The Original Fun Flour Maker (1927), The Wild Westerner (1928), Grace Johnston and the Indiana Five (1929), the 1929 and 1930 Metro Movietone Revues, The Grand Parade (1930), Crashing the Gate (1933) and feature films Glad Rag Doll (1929), Call of the West (1930), Brothers (1930), Rain or Shine (1930), The Range Feud (1931), Under Pressure (1935), and Follow the Boys (1944). Specht’s Society Syncopators, sometimes called the Georgians or Specht’s Syncopators, in 1922. Paul Specht is at right with violin and trumpeter Frank Guarente is back center. Who are the Society Syncopators? According to Michael Harris in The Rise of the Gospel Blues, when it came to the names of popular music recording ensembles of the early 1920s, “jazz was the most frequently used designation, with various forms of the word syncopated a close second…in 1923 appeared the Society Syncopators.” Initially, I thought the band on this record was Fate Marable’s Society Syncopators; Marable, a jazz pianist, led bands on Mississippi river boats that were the proving grounds for many of the legends of American jazz. That suspicion, however, was quickly rejected; Marable’s Society Syncopators only recorded one record – Okeh 40113, which has neither of these tunes. Strangely enough, the answer was suggested when I checked the recording date for Triangle 11145 at the Online Discographical Project: their database mistakenly lists two entries for this record, suggesting that it may have been issued with two different labels. The first, the one I have, only refers to the Society Syncopators; a second seems to refer to “Paul Specht and his Orchestra” on the A-side (that title may be an error – see below) and “Specht’s Society Syncopators” on the B-side. 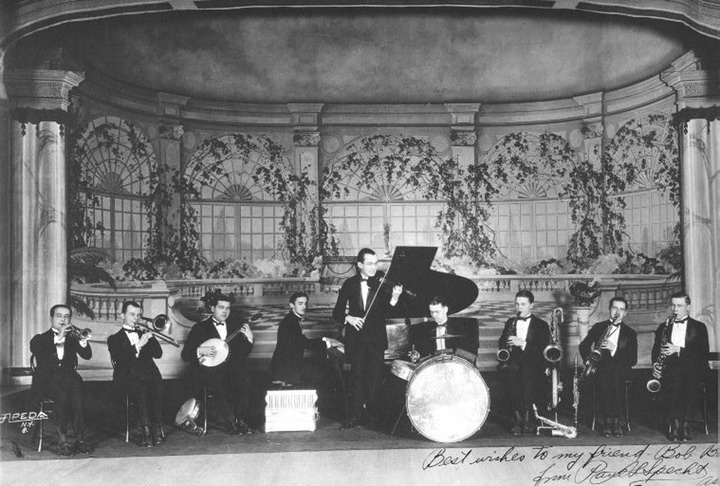 Paul Specht and the Society Syncopators/Serenaders in 1921, with trumpeter Frank Guarente at the far left and Specht in center with his violin. That’s right: jazz violin. This recording, of June 29, 1922, was only the second made by Paul Specht’s orchestra – first coming five days prior with a recording session of “A Dream of Romany” and “In Rose-Time,” billed as “Paul Specht’s Society Serenaders,” a name which was used by the band in live performance from at least as far prior as December 1920. 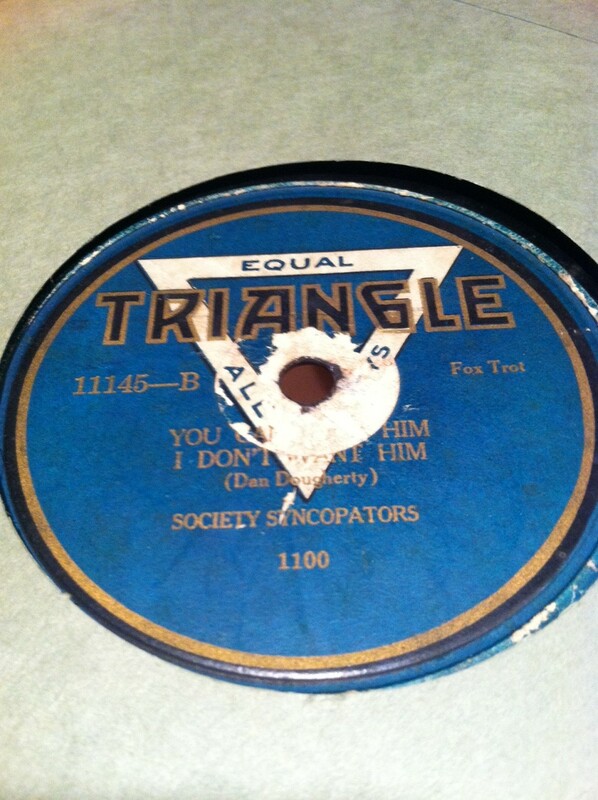 The band’s recording of the songs on this Triangle record appeared simultaneously on Banner 1090 and Imperial 1184 as “Specht’s Society Serenaders,” Paramount 20148 and Puritan and Triangle 11148 as “Specht’s Society Orchestra”, “Specht’s Society Syncopators” and, of course, simply as “Society Syncopators”, Emerson 10546 as “Emerson Dance Orchestra, and Regal 9341 again as “Specht’s Society Syncopators.” This illustrates the general lack of consistency in band names from the period, especially on printed labels, and also the on-going use of pseudonyms for, not simply solo musicians, but entire ensembles. Interestingly, studio records show the recording session of June 29, 1922 was booked for “Specht’s Jazz Outfit,” a name not found on any records issued by the group. The ensemble for the recording – and on this record – comprised of Paul Specht conducting, Frank Guarente on trumpet, Ray Stilwell on trombone, Johnny O’Donnell on clarinet, alto sax, and bass clarinet, Arthur Schutt on piano, Joe Tarto on tuba, and Chauncey Morehouse on drums. 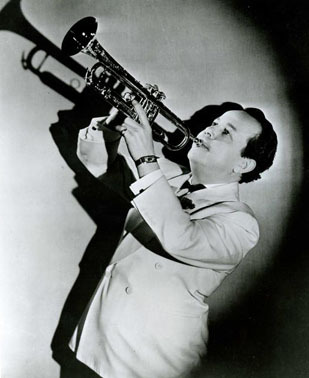 Early jazz trumpeter Frank Guarente. Though Guarente left Specht’s ensemble, cordially, in the mid-1920s he is most likely the trumpeter on this particular recording. 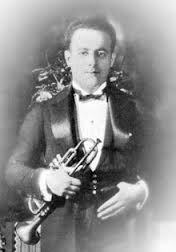 Frank Guarente is likely the trumpet soloist featured on “Hot Lips.” Guarente was born in Avellino, Italy, in 1893 and emigrated to the U.S. out of Naples in 1910. 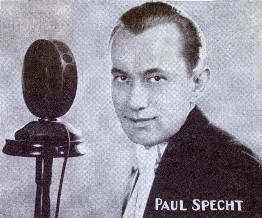 Paul Specht (1895-1954) was raised as a violinist by his bandleader father, Charles Specht. After graduating from Combs Conservatory in Philadelphia in 1916 Paul put together his first band. 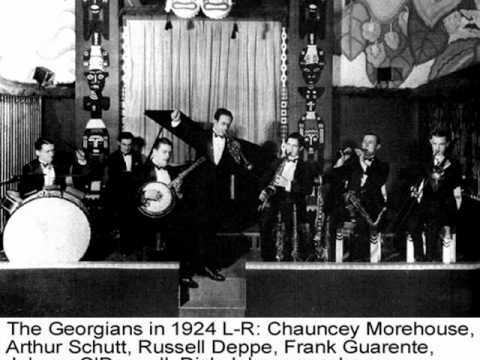 The group signed with Columbia in 1922, recording both as the larger band (called Paul Specht and his Orchestra – the reference to that ensemble having made this recording seems to be in error, as this record was pressed by the smaller jazz-focused set) and as a smaller jazz subset that Paul called The Georgians and, later, the Frisco Syncopators or the Society Syncopators. 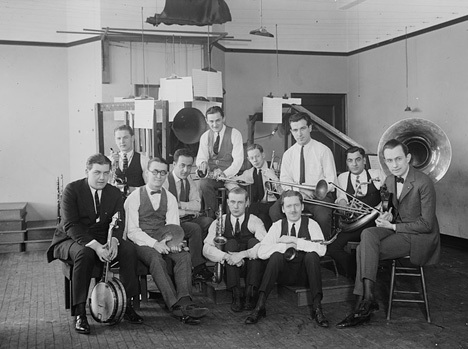 Specht and both of his groups were quite popular throughout the 1920s and starting in 1922 they toured several times to England, where Specht eventually established the “School for Jazz Musicians” in 1924. Specht’s ensembles started the career of many notable jazz musicians, including Charlie Spivak, Joe Tarto, and Chauncey Morehouse, among many others. Paul Specht on board ship for one of his several trips to England in the early 1920s. While overseas, however, the group ran into legal troubles: the British government refused to grant them work permits, a fact that Specht only learned after their ship was half-way across the Atlantic. 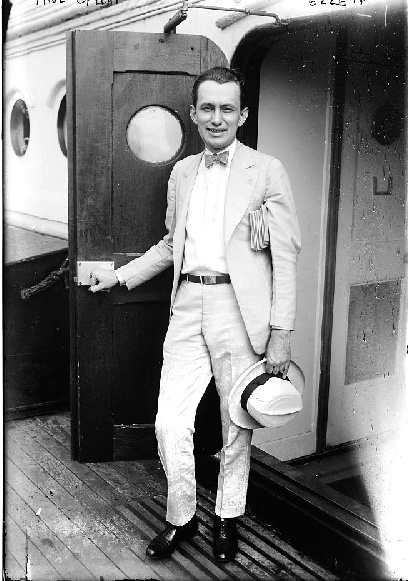 Fortunately for Specht there was a delegation of attorneys, as well as American Secretary of State Charles Hughes aboard the same vessel; after playing some concerts for their fellow passengers, Specht made an entreaty and they intervened on the group’s behalf. There was some diplomatic and legal wrangling, but the group was allowed to disembark and perform. 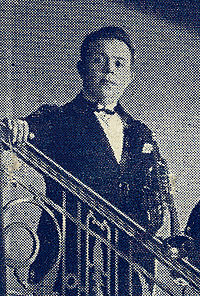 Specht was embittered by the experience, in addition to hassles he ran into with the British music unions, and did not return to England again after 1926, despite the existence of his school and the popularity of his music with the British people in general. 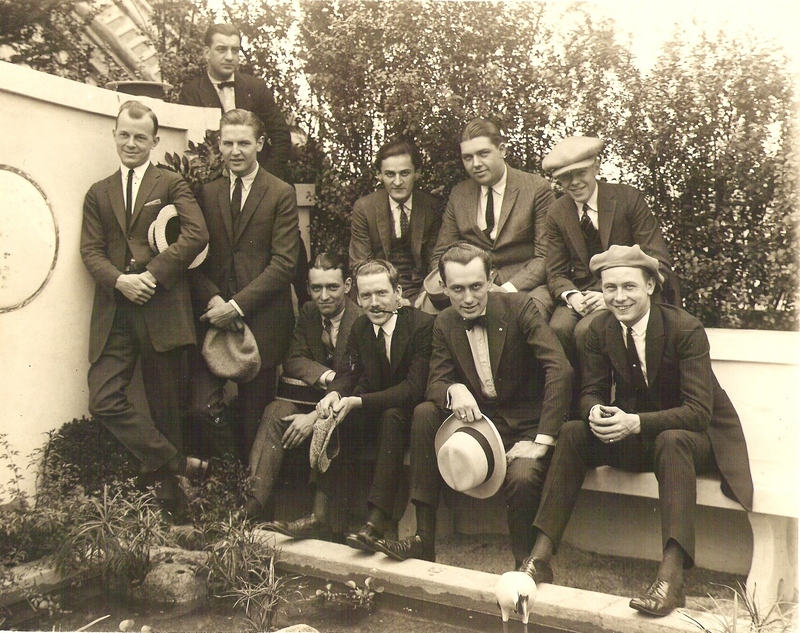 Specht (leaning forward with the white hat in his hand in the front row) and the band in England in 1923. Specht’s group went on to become the first orchestra to broadcast for RCA, the first to broadcast on a nation-wide radio network (covering 109 stations in all), and one of the earliest to issue a “phonofilm” – sound on film – with a 1925 release. 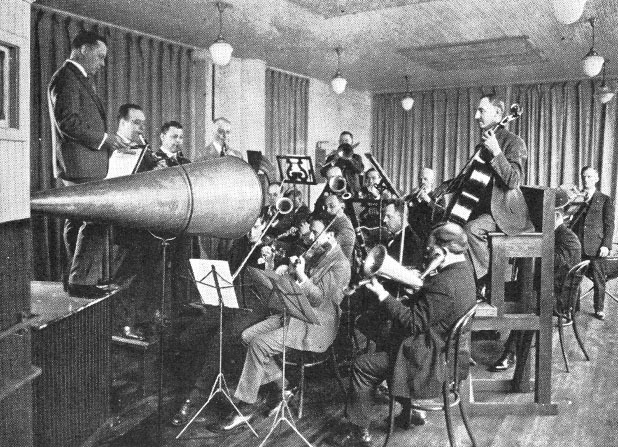 While Specht’s was the first orchestral phonofilm recordings, it was not the first phonofilm recording at all, as some have suggested; the very first phonofilms were made in 1922, with the first public presentations in 1923. 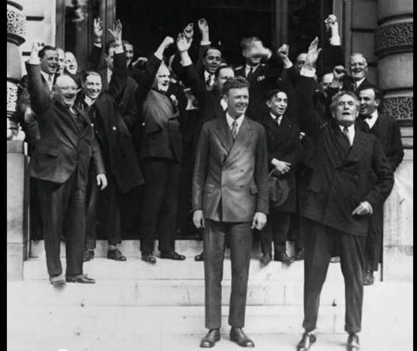 Ironically, in 1929 Specht’s group was selected over Paul Whiteman’s (with Henry Busse and Henry Lange) to play at the inauguration of Herbert Hoover. Arthritis hampered his ability to play into the 1940s and he turned more to arranging music for radio and television until his death at age 59. 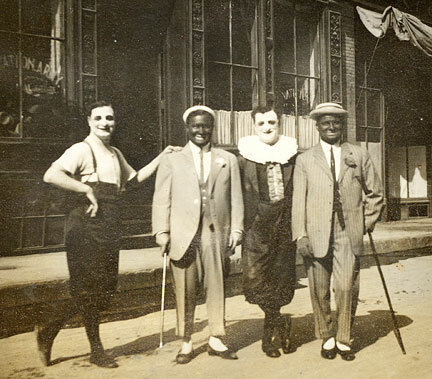 Guarente, center, is the star of the show in this performance by The Georgians in 1924, towards the end of his affiliation with Specht’s ensembles. There are all kinds of fun little tid-bits of history associated with this record. The Bridgeport Company, the two “Frisco” bands, Busse’s fascinating career, brush with America’s most famous mobster, and his ironic death, Specht’s diplomatic drama and important role in early sound film, not to mention the “monstrosity” review. The fact that this record features a (once upon a time) hit back to back with a song that seemingly went nowhere is an extra historical treat. There’s still a lot of mystery around this record – why leave Specht’s name off the band’s credit if he was a relatively well-known celebrity? Why no vocalist for two songs written with lyrics? Who decided to do that? 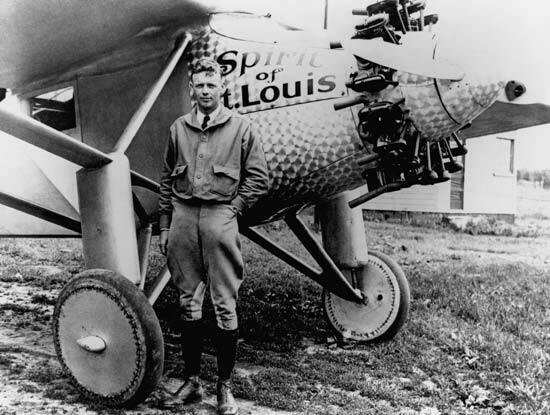 Who was Lou Davis? Maybe you know the answers to some of these questions or can provide more background on these tunes and this band. According to my research this record – truly drawn at random from my collection this time – has no monetary value. But I think it still adds another kind of value to my collection, nevertheless.